Welcome to the website of SplitStop high-performance screws and DeckEase hidden deck fasteners system, products of Titan Metal Werks, Inc. Insist upon SplitStop high performance wood screws and composite screws for your deck building or woodworking project needs. 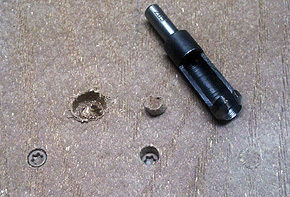 Place wood screws within 1/8 of an inch from the edge of a board without splitting the wood! Install decking and railing balusters with little fear of splitting! 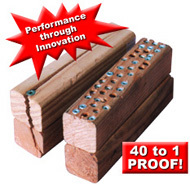 Penetrate knots without shearing off wood screw heads! Countersink effortlessly, even in hardwoods! Eliminate unsightly mushrooming around deck screw heads in composite decking while exceeding the normal expectation for drive performance in composite decking! All without need of a predrill or countersink. Don’t be Deceived by “Look-a-Like” Products! It is said, “Imitation is the greatest form of flattery”. The problem with that axiom in this case is that none of the similar looking products, recently appearing on the market, can provide you with, true, SplitStop High Performance characteristics. A screw may seem a simple device but a very high level of technology and innovation goes into the design and manufacture of SplitStop screws, technology that is not always discernable by the unfamiliar, untrained, eye. SplitStop screws are covered under one or more patents 5,516,248, 5199,839 and Patents Pending, limiting the ability of copy-cat products to mimic the exact design qualities and performance of the SplitStop screw. Be assured of performance that exceeds your expectations. 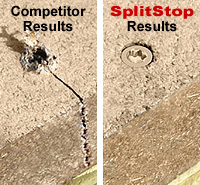 Be sure that the fasteners used on your important project are the real, authentic, SplitStop brand. You’ll be glad you’ve insisted upon the very best! 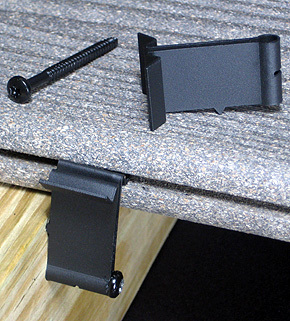 A Simple, Economical, Versatile and Lifetime Warranted Solution to Hidden Deck Board Fastening.